A package offer from Black Cat Music that proved so popular before, is back for July. 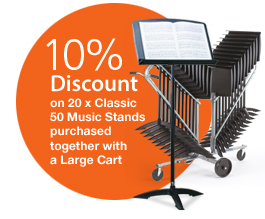 As a special promotion, 20 x Classic 50 Music Stands plus a large size Move & Store Cart are offered with a saving of 10% by Black Cat Music, for July only. The package normally priced at £1,393.60 is on offer throughout the month at just £1,252.24 plus VAT and delivery. Schools and colleges looking to equip with new music stands designed for robust and regular handling can take advantage of this great offer as the summer break approaches. Already a top seller, the popular Classic 50 Music Stand doesn’t compromise on a design that is tough enough to handle the hardships of regular classroom use thanks to a formula of advanced polymers offering inherent tensile strength that will not bend or dent like metal stands - a design that also makes it quiet and rattle-free during performances. And the scratch resistant desk surface also incorporates a unique recess for keeping pencils in place. When the performance, rehearsal or class is over, stands can be stacked on the easy to load Move & Store Cart for transport and convenient, compact storage.